With an ever-expanding curriculum for students today, School facility is now a vital part of the learning process. As institutions that are built to last forever, it is necessary for schools to accommodate a lot of transformations in the constantly evolving educational world. Physical space is a crucial aspect of learning. A diversity in managing space is a must for creating a learning environment that is fruitful. Furniture plays a pivotal role in a child’s life. It acts as a learning tool for children and each piece must be given a great deal of attention while setting up. In fact, creativity, independent thinking and physical and emotional safety are by-products of a good learning environment and furniture is a predominant part of a child’s environment in school – and hence crucial. Well-designed school furniture is said to promote the growth of children. The Reggio Emilia approach recognises and values the environment as a ‘third teacher’. The furniture in a classroom provides the fundamental, underlying structure in the room. If a table is too crowded, the chair is too small and the table wobbles, a child who is in the middle of drawing her/her first picture with a straight line, would become frustrated. Appropriate furniture that is multifunctional can equip you with a vehicle for classroom management and can give the children the ability to feel independent and secure in their space. The good news is that there is a way of manipulating the available physical space for one’s needs. Dovetail Furniture’s offerings provide schools with the much-needed structure. 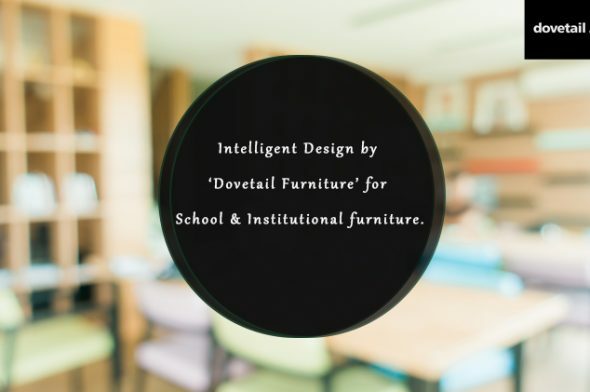 Dovetail Furniture’s intelligently made products for classrooms involves a multitude of features. The Nordic and Spaghetti desks come with well thought out storage underneath it for books, pencil cases and more. There are sheet metal book stands Attached to the front of the desks to enable young minds to read at more comfortable angles for prolonged periods. Pens rolling onto the floor is a common issue that students can relate to. The Nordic desks have grooves to place pens so that they stay put. For modular constructions, the modesty panel and storage are optional as per requirements. All the desks come with bag hooks so that school bags need not be left on the floor. Water bottles with straps can also be hung on these. The Library is the other place within the school that are great learning environments. This is where children develop a lot of skills including academic and even the interest in learning outside of the curriculum. Here students do research, network, and work together. A library must have furnishings to enhance and improve the thought processes of the children. Dovetail’s Basic and Cubix shelving are designed to be adjustable in terms of height, double or single sided as per the design. The bookshelves come in two heights, one for junior libraries and one for senior libraries, to suit the height of the children using the library. Furthermore, the book storage can be used by designers and architects to create the layout and the natural flow of the library spaces. The construction of the book storages are wooden with sheet metal shelves so that the shelves do not sag. The shelves can be adjusted according to the height of books and various storage requirements. School laboratories have specific requirements in terms of furnishing in order to ensure smooth functionality. Dovetail Furniture’s Laboratory Furniture has a variety of products in keeping with the requirements. The Laboratory Systems can be configured as wall side or island units right in the middle of the room. They come with shelves for equipment and chemical storage that is accessible. This is especially needed for biology and chemistry laboratories. These also come with concealed gas, water and waste removal. Physics lab work tables require enough space to keep instruments and electrical connections at the right place to connect those instruments. Dovetail Furniture’s physics laboratory systems come with integrated raceways that are concealed, for use of electrical equipment. The IBIS system has been designed for maximum storage at the workbench and the Axis system has been designed for comfortable seating while working, with the use of high stools, which Dovetail Furniture also provides. Children are the pillars of our nation’s future and providing them with an environment for developing their learning requires a good set of educational furniture. In order for them to have a pleasurable learning experience, the school management must ensure that the students get the right furniture. Using furniture from Dovetail furniture also enables school owners and administrators to feel confident that their furniture will serve their students for many years to come.